Fort Barry in 1928 showing the layout of the post. From left to right are the two barracks, the fire station, the hospital steward’s residence, the post hospital, the post headquarters, and four duplex officers’ residences. The army planted trees around the buildings to provide necessary breaks from the wind. 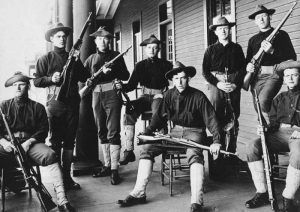 Fort Barry, California soldiers, 1908. Fort Barry is a former United States Army installation that protected the San Francisco Bay area with a line of gun batteries perched at the edge of the Pacific Ocean. 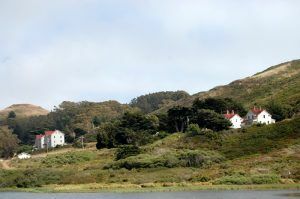 Located in the Marin Headlands of Marin County, California north of San Francisco, the 1908 fortress is part of the Golden Gate Recreational Area today. Fort Barry is one of three historic military posts located in the Marin Headlands, which also includes Fort Baker and Fort Cronkhite, which were constructed at different times and the army managed each post separately. However, during wartime, all three posts fell under the jurisdiction of the Harbor Defenses of San Francisco. Fort Barry, California buildings today by Kathy Weiser-Alexander. San Francisco Bay, just over the ridge to the south, with its sheltered harbor, rich natural resources, and mile-wide entrance, has long been recognized as an ideal location for the defense of the naval and port facilities by seacoast fortifications at the harbor entrance. By the 1850s, the U.S. Army realized that Marin’s proximity to the ocean made for excellent defense sites and began to negotiate the purchase of the southernmost tip of Marin for seacoast defense fortifications. By the end of the 1880s, as military technology expanded, many of the army’s “modern” defense systems had become outdated and the War Department expressed growing concerns about the dilapidated condition of the country’s seacoast fortifications. In response, Secretary of War William C. Endicott made sweeping recommendations for all major seaports, and proposals to modernize and re-arm all the seacoast forts. The “Endicott Program,” as it was informally known, became an expression of America’s new awareness of herself as a growing imperial power, the rise in the country’s industrial strength, and the new developments in military technology. Battery Mendell at Fort Barry, California by Kathy Weiser-Alexander. After the Spanish-American War of 1898 was over, the army turned its attention towards the Marin Headlands, focusing on the seacoast fortifications at the outer line of defenses north of the Golden Gate. Between 1901 and 1905, the army constructed five powerful batteries at Fort Barry that represented the new Endicott period upgrades: Battery Mendell, Battery Alexander, Battery Smith-Guthrie, Battery Samuel Rathbone, and Battery Patrick O’Rorke. The fort was part of the Coast Artillery Corps. Like most army posts, Fort Barry functioned as a small, self-sufficient town that supported the needs of the soldiers. The post had its own barracks, hospital, guardhouse, officers’ residences, stables, storehouses, and a bakery. The open, grassy main parade ground in the center of the post was dedicated to drills, marches, parades, and public ceremonies, and served as the physical and organizational center of post life. 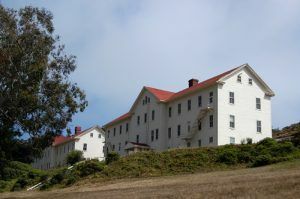 Colonial Style buildings at Fort Barry, California today by Kathy Weiser-Alexander. The Fort Barry buildings were designed in the Colonial Revival architectural style, which was popular in America at the turn of the 20th century. This architectural style favored clean, simple lines, minimal use of applied decoration, and was often characterized by large, stocky symmetrical buildings with classical elements, such as columns, porches, and wide windows. Most of the historic buildings at Fort Barry still retain much of their original building materials, like metal-pressed ceilings, original plaster walls, and built-in cabinetry. The Marin Headlands Visitor Center is in the old Fort Barry Chapel, courtesy National Park Service. Fort Barry was discontinued as a U.S. Army installation in September 1974 and the lands were given over to the National Park Service. 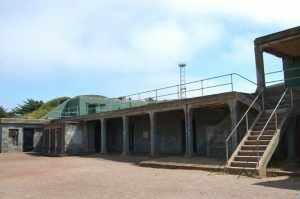 In addition to several buildings, the site features several historic batteries, including Battery Mendell and Battery Alexander, and the Point Bonita Lighthouse area. 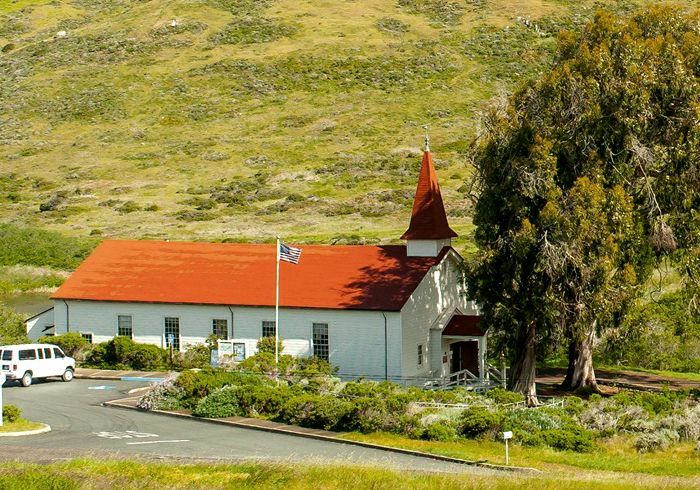 The former Fort Barry Chapel now serves as the Marin Headlands Visitor Center. 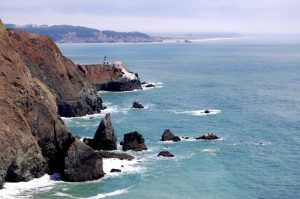 Marin Headlands features one of the largest concentration of coastal defenses in the country, with Forts Baker, Barry, and Cronkite sitting side-by-side along the southern tip of the Marin Peninsula. To reach this area, take the first exit north of the northern end of the Golden Gate Bridge and proceed west along the Park’s coastal road. Here can be seen covered and open gun positions, mortar pits, command posts, baseline stations, and World War II buildings. Virtually all of these coastal defenses were used to some degree during World War II. Point Bonita Lighthouse by Kathy Weiser-Alexander.